MINIMIZING NITROGEN POLLUTION – KBS scientists traced the flow of nitrogen through agricultural landscapes and revealed how management can be tailored to minimize nitrogen pollution to ground water. 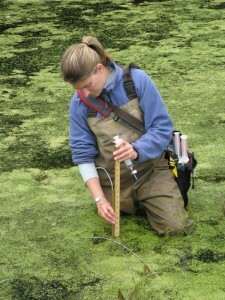 They documented the importance of spring-fed wetlands and headwater streams in removing excess nitrogen from ground water before it can cause harmful algal blooms downstream. Through a variety of long-term studies, KBS LTER research has significantly advanced scientific understanding of nitrogen cycling in cropping systems as well as in the broader landscape. Agricultural landscapes commonly have excessive concentrations of nitrate (an especially mobile form of nitrogen) in ground and surface waters due to fertilizer applications in excess of what the crops can use. Nitrate that leaches to ground and surface waters can contaminate drinking water supplies, creating health risks. Eventually a portion will be carried to coastal ocean waters where it will contribute to excessive algal growth and consequent “dead zones” of low oxygen availability, such as those that occur in the Gulf of Mexico. KBS LTER research shows that average nitrate leaching to groundwater varies greatly with land management and can be reduced by using certain agronomic practices. Annual row crops were corn-soybean-wheat rotations along a management intensity gradient from conventional (fertilization, tillage), to no-till (but fertilized), reduced chemical input, and organic (biologically-based) management (no fertilizers; cover crops supply nitrogen). These cropped systems were compared with unmanaged fields and forests that were abandoned from agriculture years ago and are undergoing natural succession (change) toward becoming the native deciduous forest of the region. Source: Syswerda et al. 2012. Scientists at KBS discovered how different farming practices can dramatically reduce nitrate leaching from cropping systems. Long-term observations showed that in annual crops, biologically-based (organic) management can reduce nitrate leaching by as much as two-thirds compared to conventional farm management. This is because, unlike conventional management, organic management included cover crops like red clover that supplied nitrogen and extended the season of living cover. Unmanaged forests and fields leached little or no nitrate. Proposed cellulosic biofuel crops such as switchgrass were shown to leach very low amounts of nitrate to the groundwater. What happens to nitrate once groundwater enters streams and wetlands? Accounting for nitrogen inputs and outputs in large agricultural watersheds indicates that roughly 75% of the nitrogen humans add to landscapes disappears in transit before rivers reach the sea. This is mostly because of the microbial conversion of nitrate to dinitrogen gas, a harmless form of nitrogen in the air, through a process called denitrification. Headwater streams and wetlands are known to be “hotspots” of denitrification because they are shallow and high in biological activity. KBS LTER scientists collaborated with researchers from around the country to study representative streams in agricultural, urban, and forested watersheds. Six of the eight locations were LTER sites. This work revealed the disproportionate importance of small streams and wetlands in the landscape: even though they cover a relatively small area, they convert large amounts of nitrate to dinitrogen gas. Stream ecosystems could be managed to preserve and enhance nitrate removal, a valuable ecosystem service that improves downstream water quality. This would best be done in tandem with nitrogen conservation measures on land. The insights gained about nitrogen cycling through long-term studies can help farmers, land managers, and policymakers develop and maintain sustainable agricultural landscapes that provide society with food, fuel, and clean water, and help to stabilize Earth’s climate. Mulholland, P. J., A. M. Helton, G. C. Poole, R. O. Hall, Jr., S. K. Hamilton, B. J. Peterson, J. L. Tank, L. R. Ashkenas, L. W. Cooper, C. N. Dahm, W. K. Dodds, S. Findlay, S. V. Gregory, N. B. Grimm, S. L. Johnson, W. H. McDowell, J. L. Meyer, H. M. Valett, J. R. Webster, C. Arango, J. J. Beaulieu, M. J. Bernot, A.J . Burgin, C. Crenshaw, L. Johnson, B. R. Niederlehner, J. M. O’Brien, J. D. Potter, R. W. Sheibley, D. J. Sobota, and S. M. Thomas. 2008. Stream denitrification across biomes and effects of anthropogenic nitrate loading. Nature 452:202-205. Syswerda, S. P., B. Basso, S. K. Hamilton, J. B. Tausig, and G. P. Robertson. 2012. Long-term nitrate loss along an agricultural intensity gradient in the Upper Midwest USA. Agriculture, Ecosystems and Environment 149:10-19. Ruan, L., A.K. Bhardwaj, S.K. Hamilton, and G.P. Robertson. 2016. Nitrogen fertilization can challenge the climate benefits of cellulosic biofuels. Environmental Research Letters 11 (2016) 064007.